Try these slick styles at the pool this year! There’s nothing like a trip to the lake or a dip in the pool after a hot summer’s day on the ranch! Western swimsuits can be hard to find, but we scoured our favorite sites and found some awesome swimsuits to complement your cowgirl lifestyle. After all, cowgirls swim, too! Aqua Green One Piece from Target, $39.99. Women Plum Embellished Ruffled One Piece from South Beach Swimsuits, $155. La Blanca Borders Tankini Top, $89; Becca Color Code Crossover High Waist Bikini Bottoms, $58; both from Nordstrom. Ambrosia Halter Top, $138; Ambrosia High Waisted Bottoms, $138; Reeve Plunge One Piece, $248; all from Johnny Was. Seersucker Scoop Bikini Top, $34.95; Seersucker Bikini Bottom, $29.95; both from Aerie. Pique One Piece Swimsuit from Aerie, $54.95. Vanessa Embroidered Kimono from Johnny Was, $365. 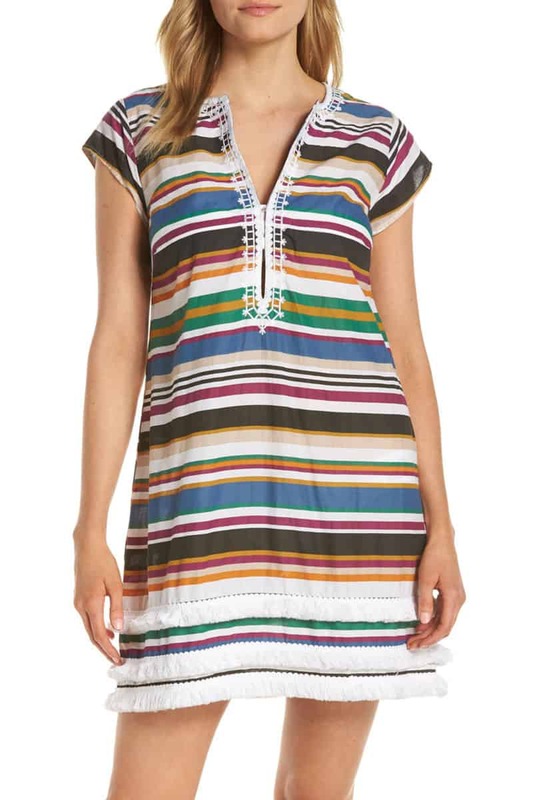 Bleu by Rod Beattie Under Cover Stripe Cover-Up Dress from Nordstrom, $85. Azalea Embroidered Tunic from Johnny Was, $198. Culotte Jumpsuit from Aerie, $44.95. If you’re looking to add some excitement to your pool day, check out this bull-riding-themed pool float!